Following the massive success of their annual event in Ealing a couple of weeks ago, it promises to be a melting fondue pot of all things cheesy - street food from the likes of Raclette Brothers and Mac to the Future along with South London’s grilled cheese connoisseurs Meltsmiths, Original Fry Up Material and What the Fattoush. On top of all that, permanent residents of the yard will serve up their own cheesy specials for the day and Shane Holland, Chairman of Slow Food in the UK hosts the Deptford Bites Live talks and tasting tent. It’s a line-up that's definitely not to be missed. Expect an extensive selection of cheese producers & importers, all vying to win the coveted We Love Cheese Cup. Returning champions Capo Caccia will be joined by the likes of Heritage Cheese, Somerset Ploughman, Bath Soft Cheese and The French Comte – and you decide who wins! Voting cards are £8 in advance or £10 on the day and include tasters of all the cheeses in the competition and a complimentary drink from one of the pop bars - wine from The Tapas Room, a beer from Off The Wagon or fresh juice from Cherry Berry. Get yours here. You can also snag tickets to take part in three indulgent sessions dedicated to our relationship with cheese. The host, Shane Holland, is the chairman of Slow Food in the UK, a global, grassroots organisation dedicated to promoting a better way of eating: one that simultaneously promotes pleasure with communitarian and environmental consciousness. Kicking off the afternoon promptly at 12pm is a pairing session that matches three Italian and British cheeses with Deptford Market Yard resident Hop Stuff Brewery's South East London made beers. The pairing is presented by John Newman, and the British/Italian cheeses are supplied by We Love Cheese sponsor, Heritage Cheese. Tickets here. Shane is then joined by wine expert Ollie to discuss how to pair wine with cheese. Guests will try three wines alongside three European cheeses and hear tips on how to match cheese and wine at home. Wine to by supplied by Deptford Bites regular Natural Born Wine. Tickets here. Rounding off the sessions is a cheesy concern that is on the tip of many tongues right now: namely, how to cut it out. Cheese is the stumbling block for so many who consider reducing dairy. But in 2018, the truth is that vegan cheese is big news. Shane chats to vegans and non vegans about the new age of cow-free Camembert and oat milk. They examine the emotional pull of cheese, apprehension about living without it and whether a country who LOVES pizza and ploughman's lunches can really be serious about ditching the dairy. Featuring Kate Bronte Stewart of Peckham's Nutkin; Signature Brew and Linzi Coe from Lomond Coffee. Tickets for this one include vegan cheeses from Nutkin and vegan beer from Signature Brewing Co. Tickets here. In addition to all this you can find some similarly cheesy characters on the South London Club stall. 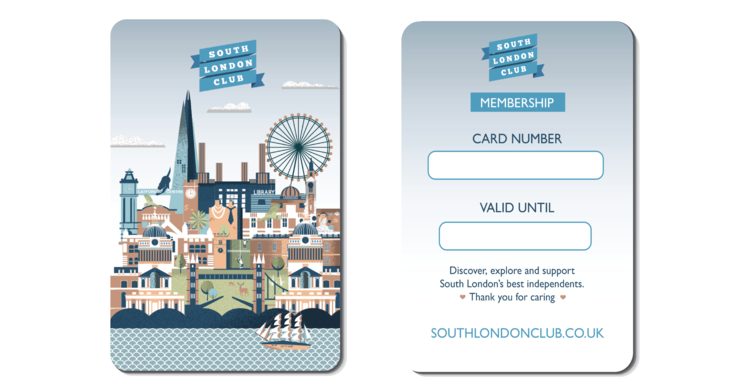 We will be at the festival all day, stacked with goodies including our South London Club cards and a selection of prints and t-shirts. If you can't make it down on the day, you can always bag yourself a card here, and shop for merch right here.